Transform your smile with porcelain veneers in Brampton! One of the things we love about practicing dentistry is the difference we can make in the lives of our patients. If you are troubled by cosmetic flaws on teeth, you will not smile as much – or feel as confident as you may want to. At Kensington Dental Office, we offer ways to help you improve the beauty of your smile. One of the most versatile of all cosmetic treatments is a smile makeover with porcelain veneers. When we say “smile makeover,” this does not imply that treatment is complex, lengthy, or costly. 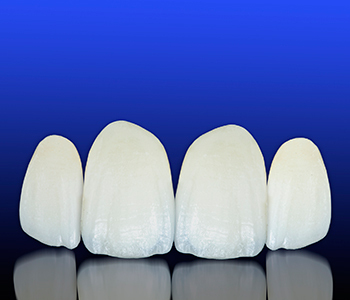 In many cases, a single porcelain veneer can make an enormous difference in the appearance of the smile. Veneers are indirect restorations that we design and order from a dental lab. These customized sheaths of porcelain are made to exact specifications that keep your smile looking as natural as possible. Porcelain is ideal because it can be crafted to look translucent at one end and more opaque at the other. By paying close attention to the tiny details of your teeth, Dr. Joshi is able to recreate a lovely appearance that even most dentists would not be able to identify as a veneer. Your best smile is just a few visits away! Veneer treatment is precise, but also relatively quick. In preparation for veneers, we will slightly reduce surface enamel. This facilitates a stronger bond and allows the veneer to lie flush so your teeth will not appear bulky. After preparing the teeth, we will take impressions to make a model. This will be sent to the lab with our specifications for size, color, shape, and other characteristics. When you return for the placement of your final veneers, we will temporary apply your restorations so that you may view them in the mirror. If you are not entirely satisfied with your new smile, we will make the necessary modifications to perfect your veneers. Often, this requires no more than slight changes to shape or size, which we can do right here in the office while you wait. Upon your approval, your veneers will be bonded to your teeth, where they can remain for years with good care. Learn more about the veneer process when you schedule your consultation at Kensington Dental Office in Brampton.